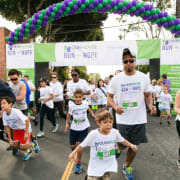 On Sunday, April 28, OUR HOUSE Grief Support Center will be hosting the annual Run For Hope - an event that gives children, teens and adults the opportunity to celebrate and honor the memory of those close to them who have died. The event has been rapidly growing, and this year we expect more than 1,800 participants. We are excited and honored to offer this day as a Community and Family Event. As a volunteer led organization, OUR HOUSE understands the spirit of giving and is very appreciative of the time and energy individuals and organizations give to support non profits. We hope that you will be able to join us in this special day! We are looking for more than 100 volunteers to help out the day of the Run. Below you will find a list of different volunteer opportunities. All volunteers will be provided with a Run for Hope t-shirt, parking, coffee/tea, and breakfast. Thank you in advance for your support and time. Please let us know of any special needs or limitations you may have that day. We will do our best to assign you to an area best suited to your strengths! Email Shannon at Shannon@OurHouse-Grief.org with your interest.